Everyone loves pets, and they love us unconditionally in return. The question that naturally comes to mind is: Which are Mr. Sloto’s favorite pets? This July and until August 15th, you’ll find out which are the most exotic pets are when spinning some of the loveliest slots with huge bonuses and free spins! Spin the reels of the luckiest pet-themed slots for your chance to collect 2 huge bonuses and 350 Free Spins! 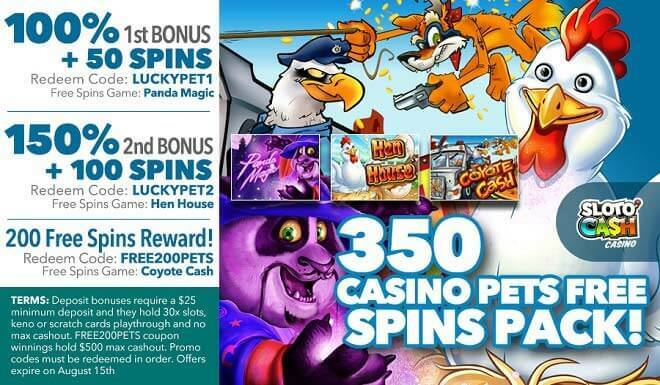 Begin with a 1st 110% Match + 50 Panda Magic Spins, continue on to a 2nd 150% Bonus and 100 Hen House Spins and overload with cuteness and wins when you play with a 200 Coyote Cash Free Spins Reward! Spend your last days of July and start of August alongside Mr. Sloto’s most unique pets and incredibly rewarding bonuses and spins!